If you have any suggestions, something you want to write about or pictures to add, please feel free to contact me and I'll tell you how to get it in, or I can do it for you. 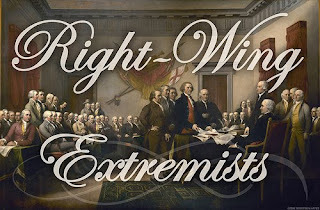 Please: keep comments on topic and nothing derogatory about anyone (well, unless it's about anti-gunners!). 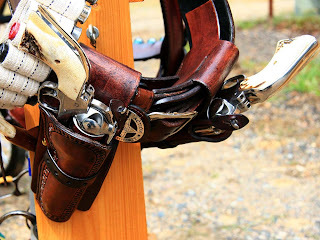 Welcome to the Virginia Rifle and Pistol Club's blogsite. A member-guest gun club, we are sure you will find a shooting activity you will enjoy following as a member or visitor. 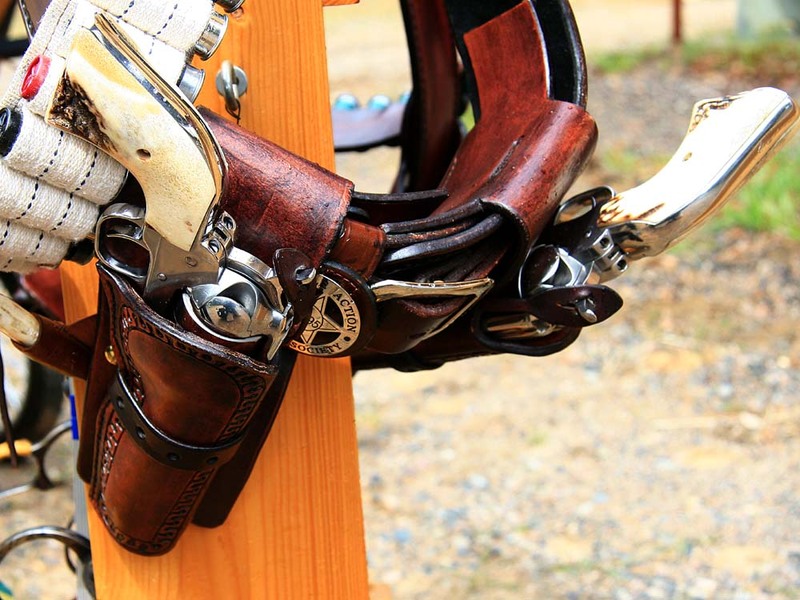 Whether rifle, pistol or shotgun, self defense or Carry Permit classes, cowboy style or blackpowder or modern, our club aim is to serve our area's needs in firearm use and welcome any feedback you may have. Feel free to browse the pages, read the articles and enjoy the photography. Here's a taste of what happened during the Squity Eye this year. Enjoy, please: don't think I can handle the criticism! LOL- thanks for a fun event, Folks. THere were a lot of cowboys and cowgirls having a blast of a time, wish I'd been able to get more included. There will be pictures in the next post and a more in-depth analysis. Thanks for watching. Next club meeting will be on Thursday, May 27 beginning at six-thirty pee-em (that's 1830 hrs for you civilians). More great news: the club now owns the property on which the outdoor range is located. Be sure to thank the mayor, city council members and Commissioner Keith Nelson for their efforts on our behalf. Notice the club calendar also: especially if you're intending a trip to the range for some individual or group fun. Since the range schedule is well-packed you don't want to intrude or be turned away (like that'll happen- but it could). Also, when you do go to the range, please pick up after yourself. No need to make a mess for others to pick up after you. Thanks. Dan's just beginning to get mobile after his hip surgery, so he was a bit late getting membership checks deposited to the account- which is why you may've not seen the canceled check on your statement. They're in now so no sweating any longer. Steve S. won the DCM match with his 404/3X score. He's one of Dan's junior students. This was his first match, so be sure to congratulate him, wish him a long and happy shooting career. Again, it's always wonderful to see new shooters getting involved, especially youngsters. Remember, too, the Forkhorn Camps coming up- July 21/Aug 4/Aug 17, 0900 hrs to 1500 (that's 9 to 3 for you military types)- volunteers are a truly welcome sight to the young shooters as well as those who're putting in the extra hours of working with the kids. If you have any questions about the matches, or any shooting, give Dan a jingle (his number's on the sidebar, as are other directors). 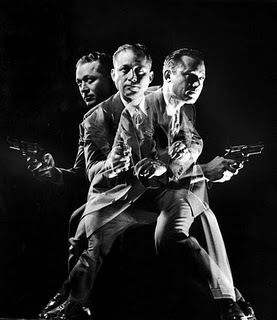 Dan has the next CCW class scheduled for June 21-22, so get signed up by calling Dan. 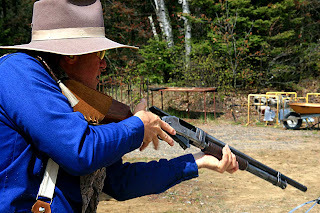 See you at the meeting Thursday and at the Range all summer- again, check the calendar, it's busy and fun-filled for your enjoyment. Remember: chamber empty, muzzle down range, no loaded weapons unless at the firing line. 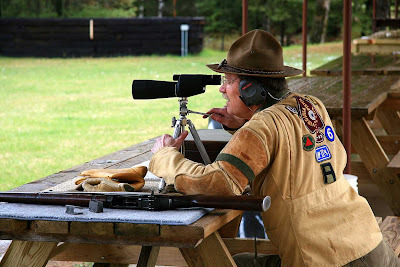 be skilled marksmen if later called to serve in the Armed Services. Department of Civilian Marksmanship programs and shoots are all about accuracy with military weapons shot from three position: standing, sitting and prone. All timed and include magazine changes. Shooters had a damp, dripping morning to set their targets and make their scores- weather doesn't stop a military marksman. 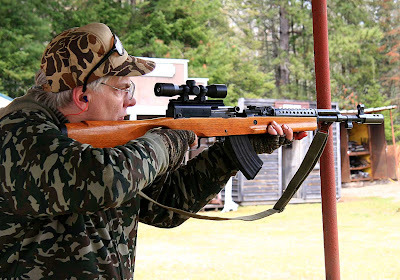 This April I attended the Appleseed shoot at the Duluth Sportsman's Club- two days of .22 shooting at 25 yards at diminutive targets. Nineteen shooters sent more than 700 rounds each downrange in two days, had a blast of a time and came away better shooters (I think) than we came. 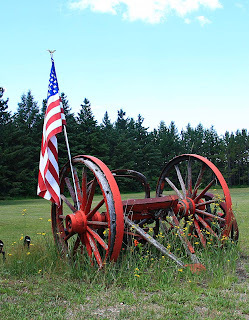 If you've not done an Appleseed, it's a Basic Military Marksmanship AQT shoot and very alike the DCM, with a bit of American Revolution history thrown in. 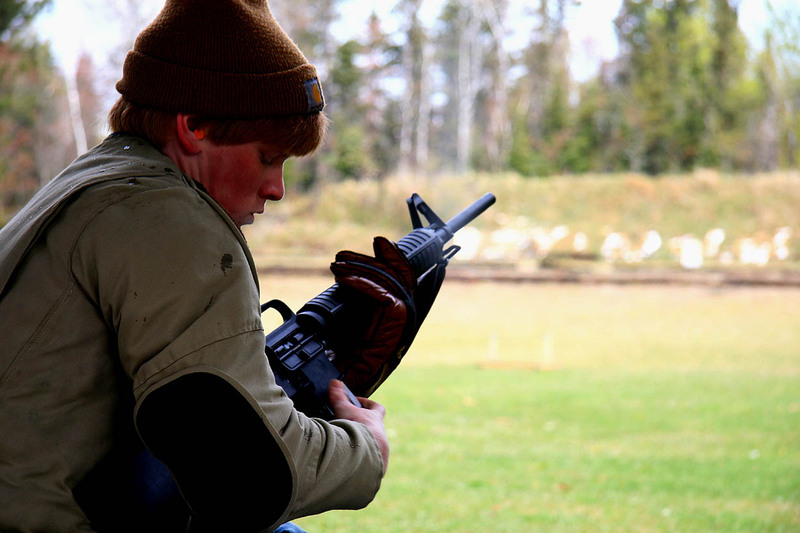 One of the best ways to insure your young ones can shoot is get them shooting, and the CMP program or an Appleseed are two of the best ways to teach them how a rifle works and how to get the hits. So, let's get the kids shooting, Folks. While they're on the firing line, be getting your gear ready for your turn. I'll be on the firing line at the August shoot, sure hope to see many others there as well. Be safe, All- keep the muzzle down range. The gunfight began at High Noon today as the Cowboy Action shooters saddled up to send the first rounds downrange, eliminating charging buffalo and stampeding bulls amid a flurry of Badman activity. 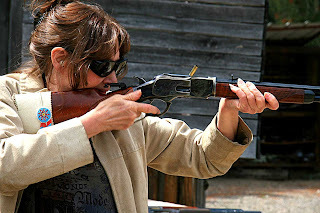 But it isn't just the guys who spent the afternoon defending the Home Range- as in the Days of Yesteryear, the women-folk are also responsible for keeping meat on the table and warding off the outlaws. Proving they're no slouches, notice the empty brass floating above the ejection port-- and the next shot is almost on the way. 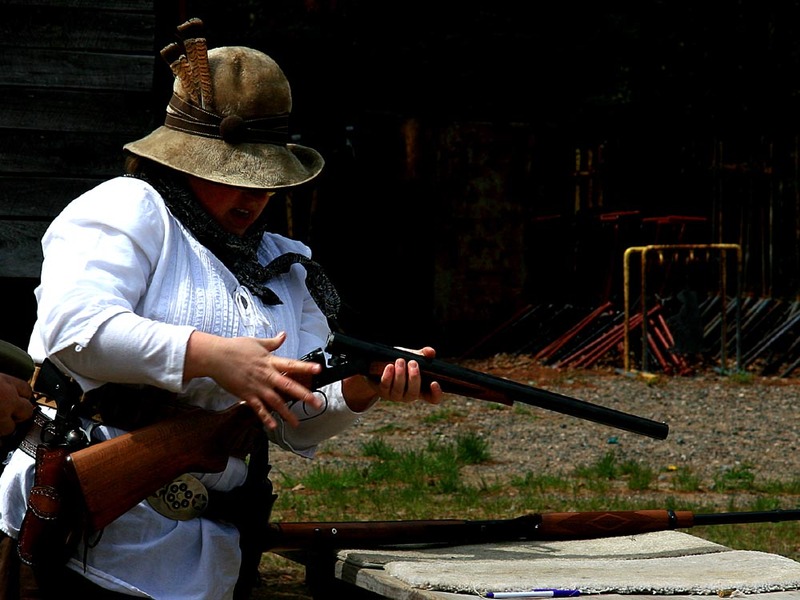 Ladies not only get to play with rifles, they are also expected to handle the scatter guns and belt-fed weapons: those old-fashioned single action wheel guns no cowboy would be caught without- and many wished they had been! Speed is of the essence with Cowboys. After all, that herd of buffalo is coming fast and need to be downed quickly. Of course, someone is always Top Gun when the sunset begins to paint the western sky. But all have a rip-roaring time gunning for top spot. And what would a cow-town be without the gabardine of the era? 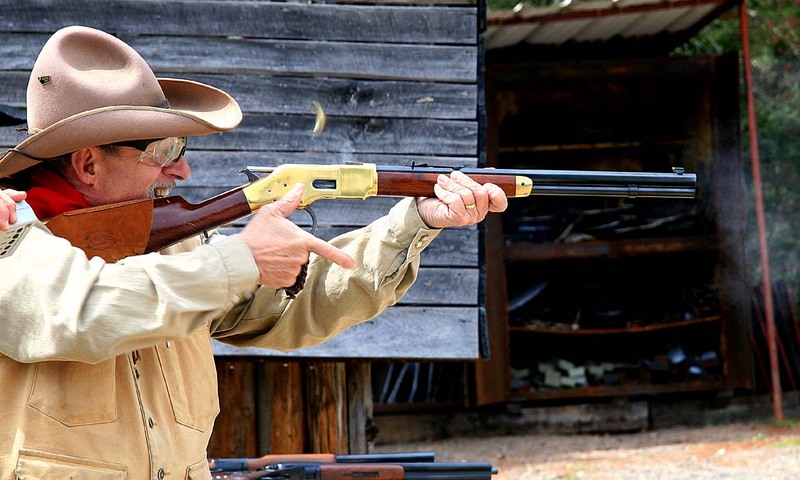 Put on your best Sunday hat, polish your boots and slip your gunbelts around your waist and come to the next week-end Cowboy Action match June 12. Have fun, shoot straight and remember- keep your eye on the target. Anti-Gun Legislators Trying Remove Pro-Gun Amendment from Trauma Care Bill! When Senate File 2866 was originally introduced, it contained a potential backdoor registration scheme that would have empowered the Commissioner of Health or any trauma hospital to collect and store a patients firearm ownership and carry permit information, creating a defacto gun registration system. Coming to the aide of law-abiding gun owners, pro-gun State Representative Mary Holberg (R-36A) offered an amendment to Senate File 2866 which would prevent the Commissioner of Health or any trauma hospital from creating such a registry. On April 8, this amendment was adopted with broad bi-partisan support in the House by a vote of 92 to 38. But now, anti-gun legislators are attempting to remove Representative Holberg's amendment in conference committee. Please contact the following conferees and leadership members and urge them to support State Representative Holberg's amendment. Sarah Palin will be giving a speech at the annual NRA banquet this spring. Following is a speech she has been asked to use. Read, consider the words and implications of them on your life and that of your loved ones. (Copyrite 2010 by the JFPO) S.W. The globalist agenda slithers ever closer. Ever closer.Fragile freedom is flickering out all over the globe. Collectivist authoritarianism spreads like a plague.